east van baby: Food Journey 6 months In! Food Journey 6 months In! Max and I's food journey has been a roller coaster (naturally) since the day we started. As with anything else in life, it can be better (ie. he eats something new every single day) but it also certainly can be worse (ie. not eating at all and health is affected by it). i'm happy, Max is happy, Max is eating and thriving (22lbs 9oz and 74cm), what more can one ask for? the best time to get him to love a food was to feed it at his hungriest time- breakfast. reject last night's dinner? Surprise! you're eating it for breakfast! he wont always eat on the highchair, sometimes i let him play around and he comes back to me like a yoyo when he wants another bite. other times i go to him. 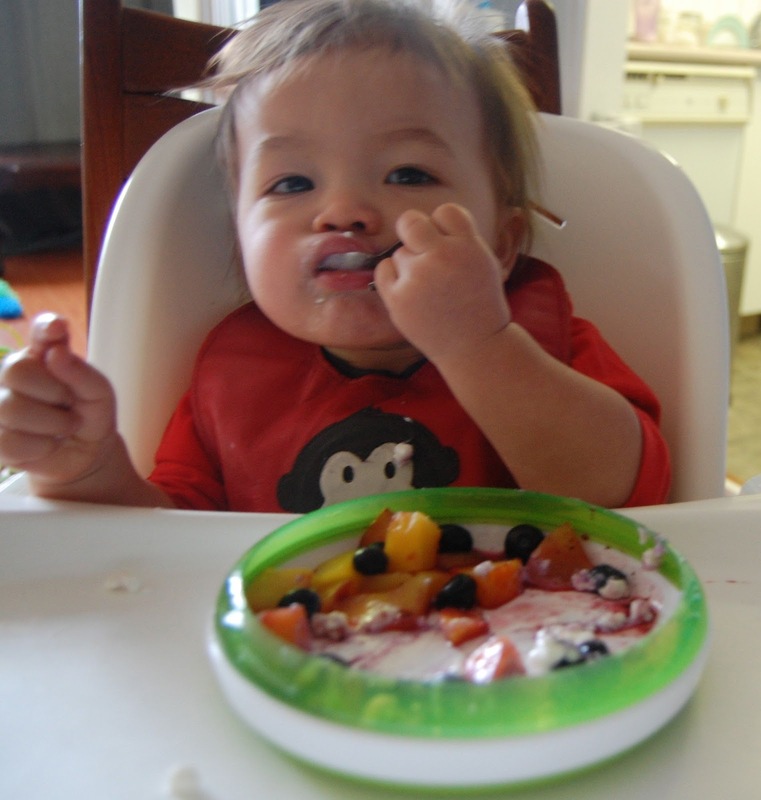 January 2013, wouldnt it be nice if he fed himself with the spoon? He seems interested in learning! Max's currently favorite foods include blueberries, mangoes, bananas, macaroni and cheese, open faced broiled cheese toasts, toast in general, white spot french fries, mum mums, nutrios, anything from the Baby Gourmet squeezable pouches, beef stew and my spaghetti sauce. It seems like quite the variety, but really it's not as at times he seems to have the same thing every other day and sometimes everyday. Im looking forward to our food journey future as after Max turns 1, more flavors can be added to the menu. Peanut butter and honey sandwiches? Brie and apple sandwiches? Stir fry prawn fried rice seasoned with sesame oil? Pizza with all the trimmings from Sunrise Pizza on the Drive? Yes! i'm already on pinterest pinning all these wonderful looking dishes, now i just need to make them!